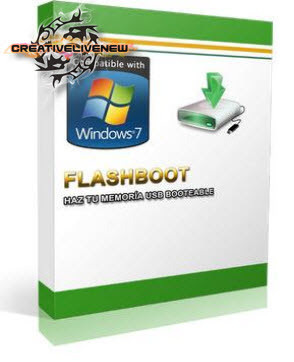 FlashBoot is a tool to create bootable USB disks, USB Flash Memory keys and cards mainly. What are the benefits of such devices for you? Let's see: unlike the most bootable medias, bootable USB Flash keys are very handy: compared to floppies, they have much bigger size, speed and reliability, compared to CD-ROMs, they are random write access devices, so you can backup your data to the same media where you booted from, without need to reformat (reburn) the entire media. Also, the cost per MB for them continues to cut down lately, which is not the case for floppies and CD-ROMs . And the most important thing is that you can use bootable USB Flash Disk almost everywhere, on any PC that has USB port. Are you going to repair your PC at your work without CD-ROMs, floppies or other media? No problems anymore. Or you have a laptop but without a CD-ROM drive? Even if with a CD-ROM drive, you can't work with it for a long time: boot device is accessed quite often, and battery power is obviously not enough to supply laser for a long time. Perhaps you are home user with a desktop PC. And you are ready to repair it with your favorite bootable CD-ROM, OK. But what if CD-ROM drive fails? Will you be able to boot or to get your backup data back? With bootable USB Flash Memory key, you may boot every PC with USB ports, regardless of non-present or broken devices, because there's no need for any extra devices. You don't have a media size limit of 700 or 800 MB anymore, and buy a big or a small disk depending on your needs. Just after boot, on every PC, you may save your files to the same device from which you booted, or restore them back. There's no need to reformat (reburn) the boot disk, you just copy files and folders, and there's no need for extra hardware for such operations. Of course you may do some things you can't do under your OS: copy/modify system files (they are busy when OS is running), reinstall OS, repartition your main hard disk etc. FlashBoot is a tool that makes USB disks bootable. It was specially designed to work with USB Flash devices. It is used to reformat flash disk (that's optional) and transfer system files to it. convert a bootable CD-ROM to USB Flash disk (again images are supported). There are some technical difficulties with supporting any type of CD-ROM here, see details below. But there should be no troubles with the most real cases. You may convert Knoppix and EBCD, for instance. create disk with NT/2000/XP bootloader. It would be useful when you have mistakenly configured it, and boot.ini file was left on unreachable disk (NTFS). duplicate USB flash disk. Just creates a copy of existing disk USB flash disk, different sizes of source and destination medias are OK.
menjadi bootable sebelum booting windows anda. Bisa juga untuk membuat installer windows XP bootable melalui flash disk anda.